Before leaving the Philipines to be taken over and occupied by the Japanese, General Douglas MacArthur vowed that he would return. Making good on his promise, he landed on Palo Beach, Leyte, October 20, 1944. The Battle for Leyte lasted from mid October, to Dec. 31, 1944. The U.S. had over 3,500 killed in action during the Battle of Leyte, and the Australian forces had 30 killed in action. General Douglas MacArthur wades ashore at Leyte, making good on his promise to return. General MacArthur surveys the beachhead on Leyte Island. Landing barges bring in thousands of troops. In this photo, many of them are watching the American and Japanese Air Forces battle it out in the sky above them. American troops hug the ground, because they are under fire on the beach at Leyte. 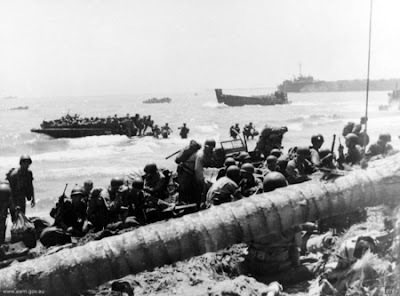 Troops storming ashore just north of Palo, Leyte Island. LST's bring in massive amounts of supplies to supply the offensive on Leyte. LST's shown bringing in supplies and men.